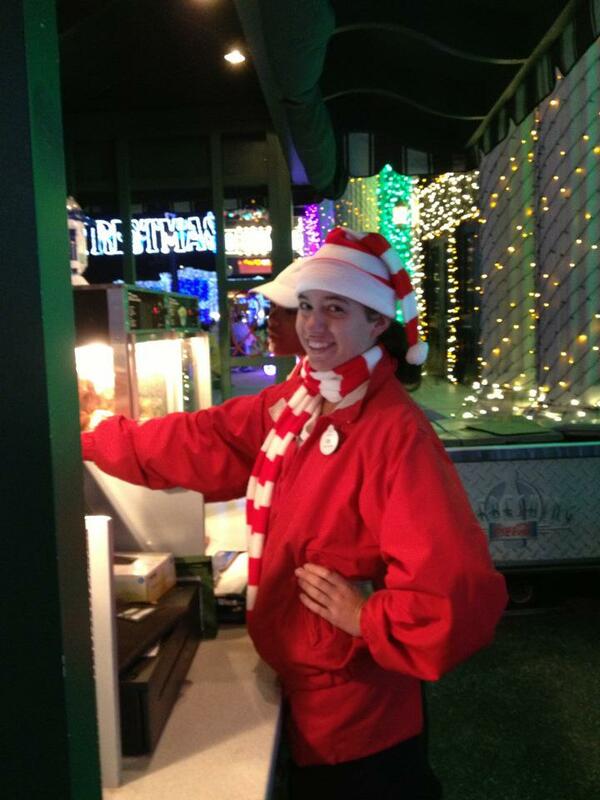 Erin working at the Spectacle of Dancing Lights! I was given the role of QSFB but when I got to casting I found out I would be working outdoor foods at Hollywood Studios. 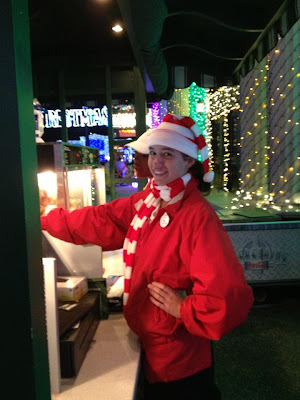 I could work at any of the outdoor carts around the park that sold items like ice cream (bars and soft serve), frozen drinks, popcorn, pretzels/churros, funnel cakes or even hotdogs at Herbies. ODF also included vending at Fantasmic. Oh...and I was there in 2012 for Fall Advantage! - An opening day would usually start around 10:30 where our shift would start with a meeting about the expected weather for the day, park capacity, and any new information about products or prices. We would then pick up our assignment on CDS (the park was split into 3 zones – Backlands, Icon, and Sunset and we would be assigned a zone on our schedule everyday but throughout that day we could work at any or all of the carts within that zone). After learning what we would be opening we would grab anything that needed to be taken out with us – like fruit, R2D2 steins, cups, or whatever the closers might have forgotten. All that stuff would go in a dolly and then we had to go get the register/count the money, the radio, and allergy book. Since I couldn't walk through the parks alone with the money I would have to wait for a stocker to come take me out and help me open. Most carts would be open around 11:15. -A closing shift would start around 3 or 4 in the afternoon. It would start like a regular shift by getting an assignment and taking over whatever is next – usually someone else’s bump-out or break. You would usually find yourself at whatever cart you had to close after your break. And that place would close about an hour before we were scheduled to get off. A stocker would come out to help us close and walk us and our money back. Before we left we would have to take inventory of everything in our cart and bring the counts back with us to find out what the reload would be. We were one of the lucky parks and our GTs would count our money for us, we just had to sort the receipts based on “credit cards/room charges” or if they paid with a “snack plan.” Then if we were closing a soda/ice cream cart we would have to take all the bottles out and count them and then reload what we took out, plus whatever we needed to get the cart up to par. Popcorn and soft serve ice cream carts had to be cleaned. Popcorn machines had to be emptied and all the oil/butter wiped out. And the ice cream machines had to be drained, disassembled, and cleaned out. At first it was a pain and took forever, but if you work in certain carts often enough it became routine and you figure out shortcuts to help get it done faster. -During the day some places would be busier than others. It was always a good day if you picked up a place that had 2 people working at it so when you did have down time you had somebody to talk to. And I actually liked working outside because there was always something going on in the park. The biggest things during the day were: we only got one break, sometimes it did get really hot (or cold), and we had to worry about constantly getting new product. Every 20-30 minutes, new popcorn had to be popped and if you were at a pretzel cart you had to call back to pretzel kitchen when you were running low on product. -Then there was Fantasmic....it was always a fun, easy shift. It started around 4, you get your break right away, and then the coordinators hand out assignments (I always worked register or filler in a food pad. Nobody wanted to get vending, because you had to be able to count all the change in your head. We were give an hour and a half to set up. Doors opened an hour and a half before the first show and the food pads would close during the actual show. Since the second show is never that busy, most of the time the smaller food pad on the far end would close and you would get to go home early. I actually did not want QSFB. I had it as low interest. I wanted attractions, character attendant or merchandise. However, I ended up loving my job, so it worked out for the best. Working with food at Disney is much better than working food anywhere else. Favorite: It sounds cliché, but the people were amazing. I met some of my best friends through my job. And not just the people I worked with, but all the employees at studios were so nice all the time. I even was able to become friends with some of the guys in Mulch, Sweat, and Shears and the 4 main cast members of the Hollywood Studios Film Crew. And I even enjoyed being outside. I got to work in the middle of a Disney park. I would spend my days singing and doing the choreography to the parade and Disney Channel Rocks (RIP Studios entertainment), The Beauty and the Beast stage show, and Mulch, Sweat, and Shears. And when I worked Fantasmic I got to watch the show! Plus....I got a lot of free food. If a pretzel cart had a lot of leftovers the managers let us eat them and I got a few free Mickey Bars and on my last day I got a cup full of soft serve ice cream and toppings. Least favorite: CLOSING SUCKED SO MUCH. It would take AGES. I can’t even remember how many times I clocked out late because closing took forever. And it was very tiring. Especially unloading and reloading the soda wagons. Towards the end of the program we all had zones we worked at pretty much everyday, mine was Backlands. Which at first I hated because everyones least favorite place (the giant coke bottle) was part of that. But I eventually became a pro at closing Herbies so I would get put there all the time, which I didn’t mind closing. I could do it in 20 minutes. Erin performing with Mulch, Sweat and Shears! I had magical moments every day. Studios was the one park where we were encouraged and required to give away free food every day. So it was fun to be able to make someone’s day in such a simple way. I had my personal favorite people to magical moment – I loved a nice old couple to surprise, or a family with a lot of kids, and especially young children who would order by themselves and were really polite. A few stand outs were I was talking to a nice family right before the park closed. And there was a high school girl who was asking me about the program and if I like it and what I do. Her whole family was nice so I gave them free ice cream sandwiches and they were floored and right before they left the girl told me I inspired her to do the program. Another one was I was at Peevy’s where we do frozen beverages with one of my best friends working with me. And we had a bride and her family (no groom) and gave her a free drink to congratulate her on her nuptials. Her whole family was like OMG and we were like where is the groom?! You have to bring him by later. SO sure enough about an hour later we hear “ERIN AND MANDY! THIS IS *grooms name*” So we gave him a free drink of his choice and they told us we made their entire vacation. And my favorite moment was more of a magical moment for me. I was having a long day and it was really hot and I was kind of cranky and this little 5 year old girl and her mom come up, order ice cream, and pay and the mom says, “What do you say?” and the little girl looked at me and said “Thank you so much for working hard all day so kids like me can have fun in the park.” I almost cried on the spot. It turned my entire day around. Not all kids are spoiled brats at Disney. I did the program because I wanted to do something big. I was tired of just sitting at college and I wanted to go out and make a difference. I wanted to try something new that other people don’t get to do. Plus Disney has always been my favorite. I wish I knew how hard it was going to be to say goodbye. I wasn’t expecting to make such good friends. Leaving and having to say goodbye to everyone was the hardest thing I have had to do. Especially because everyone lives all over the world. Not just the country, the world. But it does give an excuse to travel. Also, I wished I believed people when they said the winter months actually get cold. I was freezing. I wish I brought more jeans and jackets. Don’t go into the job with a negative attitude. A lot of people were upset about getting stuck in food and it ruined the experience for them. The job isn’t bad. It is what you make it. Also...buy comfy shoes. The first 3 weeks my feet have never been in so much pain from standing all day. Be prepared to work hard. ODF is not an easy job, it is physically demanding. And MAKE FRIENDS WITH THE STOCKERS AND COORDINATORS. If the stockers like you they will be more likely to show up to your cart early and actually help you close or open or unload you cart backstage. And if coordinators like you, they will give you an ER. And let you close places that you actually like to close. I even had coordinators that would help me clean. You don’t want coordinators to hate you. I would say be prepared to work. During the holidays most people only get one day off. Also, a lot of people self term because they thought it would just be playing in the parks all day. Don’t go and make stupid decisions like underage drinking in the apartments. YOU WILL GET CAUGHT AND FIRED. If you don’t plan on taking the program seriously, don’t do it. You are taking a chance away from someone else who actually wants to be there and follow the rules. Don’t be selfish. Really think about it. I'm a Cast Member Again!